Notice that there's no option to save the changes - it's a hard rule that is applied upon saving and you can get past this other than back out of the dialog. My first thought here is "Crap! Now what?" and off I go searching for an option to turn this off. Eventually I find a solution after a quick search online. As it turns out it's just an annoying configuration default setting that can be easily changed, but if you're like me and you spend a while searching around the Management Tools and finding nothing initially, I ended up eventually backing out of my initial database changes and losing a bit of work in the process. It wasn't until a bit later that I found the setting to change. Hopefully you'll find this entry before you back out of database changes - you can get out of the above dialog, make the settings change and then still go ahead and save changes to your database. This is a pretty harsh change IMHO. While I think it's a good idea that the tools now detect table recreation changes and can notify you, I think the better option by far would have been to pop up that initial dialog with a warning message AND provide an option on the buttons to either go forward or abort. Instead this arcane switch is going to cause some pause for most people familiar with the old tool behavior. It's not like this option is easy to find - I looked in the database options before I finally found it in the global tool options. I ran into that this morning myself. I was going to blog about it, but you beat me to it. Less work for me! Thanks for that. You're one step ahead of me and just saved me some time. I just downloaded and installed the Management Studio on Friday (ver 9.00.1399) and I don't have that checkbox in Tools/Options/Designers/Table and Database Designers. @Pamela - because that the SQL 2005 tools. The above flag applies only to SQL 2008.
learnt about that one in the beta. during that time i remember reading something about it being the default since there was still bugs in that code. turns out its now the default. wow, what are the improvement of SQL 2008 over SQL 2005? The fast upward march of versions made it really hard to decide whether to follow suite or stay put. thank you so much. stupid new "feature". i agree with xun ding. hopefully that march will now stop for a while with 2008. @xun ding: but now we have date AND time datatyp and tablenames as parameters. Thanks for posting this, really helps. How does something like this get out of beta? who the hell at microsoft decide to put this stupid settings on ? Kiddin' THANK YOU SO MUCH!!! Some day they will decide that removing access to idiots is better than idiot-proofing everything. Sure it can be a scripted chagne but when you are just doing a quick and dirty table create and all at once you can't add another column just because you hit save before walking away from your desk for a bit. Whoa. Yeah, I found this checkbox too.... BUT, what I'm more concerned about is that the reason they seem to have put that there is that it's a failsafe for loosing data if you're making a change to table that is live with data in it. Is this telling me that we have taken a MASSIVE step backwards and can now not make changes to a table on the fly without loosing data!!??? Good god that's horrible... I make changes to indexes, fields etc. etc. all the time on live databases... because I live in the real world. Thanks. Ran across this and fixed it fast because of your post. Thanks very much for this post, I was starting to get really annoyed about this. That is totally moronic. Thanks, I was so taken aback I couldn't believe at first this would be a property setting, I figured I must be missing something. Thanks for posting. Phew - this solved my problem - thank you very much. +1 on that. Scary, but easy to turn off once you know. What were they thinking. Really silly and confusing default. I agree that it can be frustrating to face this message. I agree that it would be nice if this tool just did what you want ... perfectly. I also think it would be nice if it presented a nicer dialog experience. Prompting you to permit it to change or move back. You should be aware that this tool was far from perfect in earlier versions. It did cause people to lose data. Especially bad on production systems. This change was not bug, nor was the decision made without a lot of thought. But it was in response to a "Dammed if you do, dammed if you don't" conundrum. People who had lost data were asking "Why didn't MS protect me", but the same people had issues understanding that you can't change a nullable column to "NOT NULL" if it has data & there is no DEFAULT value. No doubt you are aware that the changes that many people want to make are often far from trivial. Many can't be achieved by a simple ALTER statement. To do it correctly & to preserve data is often quite tricky. Some operations would require creating of TEMP tables to drop & recreate the objects in the new form. Perhaps needing a strict order of other ALTER statements to satisfy other pre-reqs (eg: FK constraints). Even when your change can be done with an ALTER stmts, it may require a table lock. Preventing access to your production system for an extended period of time while the DDL statement changed all rows in a huge table, checking the constraints & Foreign keys. Yes, the SQL team know they need to invest more effort to improve this area. A tool that does offer a safer "Production level" change experience is "Microsoft® Visual Studio Team System 2008 Database Edition" it can compare the delta between the original schema & your new schema & will emit scripts to make the changes you need. You can then review it & decide if that is something you'll run now or after hours. Hope this helps you to understand there are risks in changing this option & hacking away on any system with data in it. @Dave - agreed on making breaking changes to the database, but I think it would help if the tool was smart enough to figure that out. After all the scripts have to be built so the logic to figure that out have to be there. And if the changes don't work it will fail which personally I think is a better behavior (works when it can, fails when it can) than just not doing it at all. I think we agree better dialogs would help here. Ideally an option - go ahead do it anyway should be there. Thank you very much, I agree that this option could have been exposed in a more suitable way. Thanks for the info. It is a great help. I need to echo Rick O'Shay. Surely during beta someone said na... I don't think so! thanks sir for this update. I was getting this error when adding a column (not sure why this requires recreation of the table)? Thank you. I was glad to find that it isn't just me that has these types of problems. Saved me some time and annoyance, thanks again. Thanks, I'm glad that somebody figured it already! Thanks Rick. I'll add this to the collection of "dialogue-boxes-that-could-have-saved-some-hassle-with-a-smidgen-of-forethought" to use in mentoring graduates. Like many of the posts on WW, this will be useful for many people for quite some time. Thanks, you see the internet can be useful!!!! It would be nice if MS protected me with this option from loosing data. But just moving columns around, or making a text column longer can be done without loosing data. So this option is over protective. Thank you very much. This problem was annoying me. Saved lot of time. I always get excited when I'm searching for something and end up on your site because I know my search has ended! Crap is a good word for it. Microsoft thinks everyone is an idiot. Thanxs a lot ,I have worked a lot on to fix it .Stupid New feature Altest they can provide Some info about it .Once Again Thanxs a lotThanxs a lot!!!!!!!!!!!!!!!! You saved me a lot of frustation. Thank a lot for the tip. you rock! Saved me as well. Big thanks. Save me time, this was first search I clicked on. Thanks! Thanks but what's benifit of this option? Thanx much.It saved my time. Thank you. have been struggling with this since yesterday. 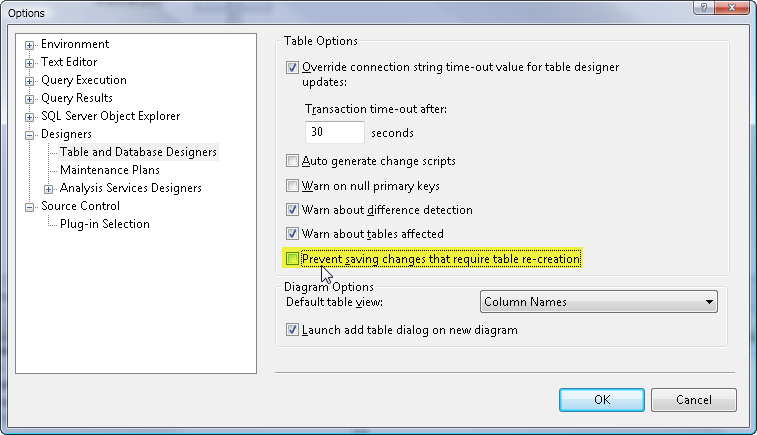 Thank you, I can work quicker now, as making changes to tables now become a matter of seconds. It's really helpful, you saved me from jumping between SQL 2005 and SQL 2008 IDE. You rock! Thanks man - this was starting to piss me off. I agree that this was something that could have been implemented better. First it could check if you even had any rows in the table before it bothered with any of the warnings. Next - the warning about data loss is cool, but they should give you the option to go ahead anyway. I got this and deleted my table to make the changes. 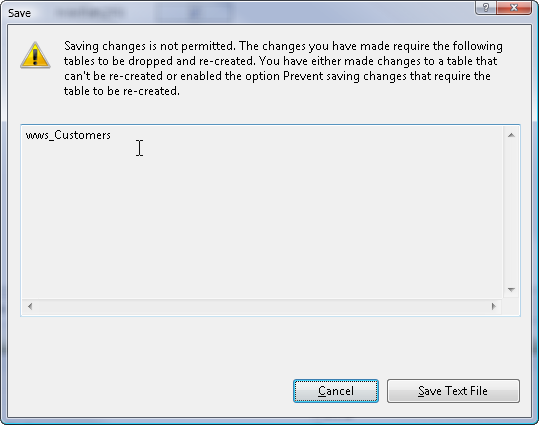 When I went to save the new table with the same name it said the table can not be created because it exists??? Searched sysobjects and it does not exist - But I can not create the table again. Saved me too big time! Thanks a million! Thanks! When I saw the error I thought this was some kind of DB option that had been set that was blocking this. It would have been a while before I thought to look at the Management Studio options for this. Just adding my thanks to everyone elses. This was driving me mad. I can be sane again. Turns a really annoying problem into a quick fix ! Now if Microsoft could have flagged that settings location in the error code ! What fun would that be......? Thank you very much for that. Luckily, I have stumbled on to your site a couple of times in the last few days while troubleshooting issues with C# and interfacing with SQL Server. This probably saved me a good couple of hours of work. all I can say is thanks for finding this out. the collective crack pipe of the usability guys on the SQL Server Team must be hot to the touch. Thanks a bunch, what an annoyance! Thanks for the info. It saved lot of my time. useful info for a 1st time user of SQL server 2008.. This was perfect advise. Easily understood and applied. Saved hours of headache and possible loss of data. Thank you. Rick, thanks for saving me lots of time. That's like the 20th time over the past several years that your blog has helped me out. Kudos and thanks amigo. Really annoying. Thanks, saved me some frustration. Wish I'd seen this weeks ago! I've been backing up, scripting, deleting, re-creating and restoring. Mugs game. Many thanks! Beat Peter Bromberg to the mark ... Day-umm ... you are good. Thanks, Rick.